Playing Blind Poker is yet another weapon in the online poker player’s armoury that is designed to lead to winning the pot of money in a game. Once again, bluffing skills need to be brought into play for a player to gain success with a strategy that relies on the power of personality rather than a great hand of cards. Playing poker blinds is a favourite tactic of players in online casinos with Live Dealer games. Poker blinds refer to forced bets that are split into two types, the small blind and the big blind. In the majority of Hold’em games, players place initial blinds or bets before any cards have been dealt, to ensure that there is money to be won from the start of the game and to create an incentive for placing further bets. 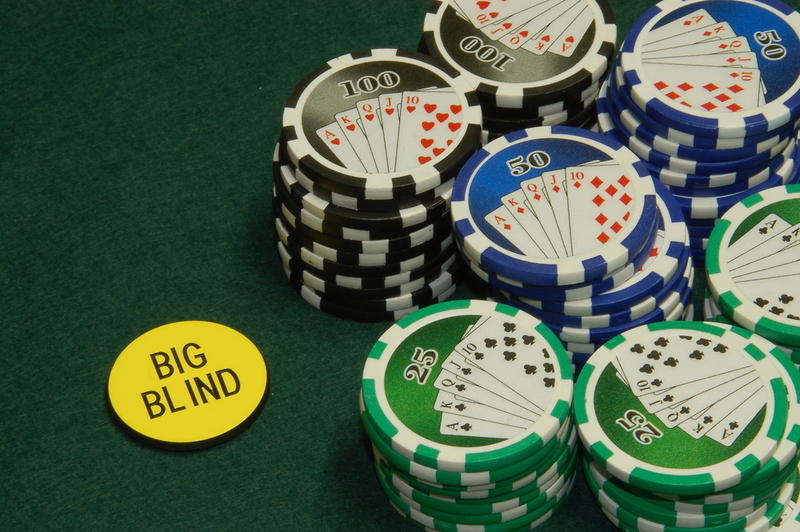 A small blind is placed to the left of the dealer and a big blind is then made by the next player on the left. If only two players are involved in a game, the player on the dealer button places the small blind while the other player places the big blind. When playing blind poker, remember the small blind wager is half that of the big blind, allowing the chance to call without risking so much money and prompting the big blind player to choose between raising or checking. It is preferable to have a fairly good hand before making a blind particularly against a stronger opponent, an important factor to remember when aiming to become a competent Hold’em player. Aggressive players are always more likely to have greater success at winning the money pot as by force of personality they intimidate other players and can bluff far more effectively. However, it is possible to implement a defence against such blind stealers. Look out for them raising far too often and follow with your own raise to pressurise them. By implying that you have a good, strong hand, they might fold but if they don’t, then you have at least influenced the size of the pot. Learning to read an opponent’s actions is far more important than waiting for the ideal hand. As a beginner gains experience, identifying when a player is bluffing becomes much easier. Becoming an accomplished Hold’em player also relies on a player being able to read his own actions and admitting when he has a poor hand. Knowing when not to play a blind is as important as playing one and can save part of a stack of chips for a later game. There’s no set rule for a starting limit, but a first big blind wager is usually around one-fiftieth of a player’s stack. For instance, if everyone starts with 500 chips, then an initial big blind bet would be 10 chips following on from a small blind bet of 5 chips. The next round would see a small blind bet of 10 chips and a big blind bet of 20 and so on. If a hand is poor, there is no point trying to redeem it by continuing to add to the pot. Its better to fold, saving your stack for the next game. Remember that not playing every hand is not a lack of understanding – an astute player is realistic. Never place wagers beyond what you can afford. Observation is the key to assessing an opponent’s style and strength. Always observe even when you aren’t actively involved. Take advantage of positional play by placing wagers you think match an opponent’s cards. Online poker games can suddenly change direction, so quit while you’re ahead! As a route to good gambling, with the chance to win a substantial amount, playing Blind Poker is a positive way of building the pot as it steadily doubles with each round. Playing blinds is also a way of preserving a stack of chips. Blinds can be useful in making a defence against stronger blind stealers as it places them under pressure by suggesting your hand is a good one. Playing blinds gives players the chance to control their own play by folding without losing any more chips than is necessary. Learning to read the actions of strong Hold’em players and counteracting blind stealing play, should lead to winning a sizeable pot.